Just like a goodbye kiss at the end of a first date, the trade deadline looms off in the distance. As the time draws near you wonder what it will be like? Passionate and leaving you wanting more? Sloppy and full of regret? Whether you like it or not, the Pens have started the akward dance by trading for Defensemen Jordan Leopold of the Florida Panthers for a 2nd round draft pick. My text inbox was greeted with this message today..
"Leo for a 2? Bad trade for an almost was, dude. A rental, too"
My thoughts? Well, we'll see. I wasn't too gung ho on the Kunitz trade until he started to play. 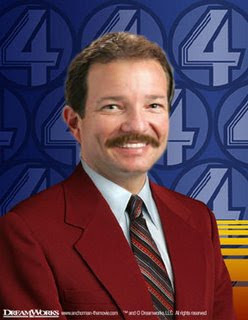 Now I can see why King Shero is the Ron Burgundy of the Hockey World. In other words, Ray Shero is THE BALLS. Tonight, Gold Medalist Sindey Crosby and Marc-Andre Fleury and Silver Medalist Brooks Orpik welcome Silver Medalist Goalie/Messiah Ryan Miller to Mellon Arena. Someone wanna play the Lottery for me. Box those numbers stat! With the change in D, the Pens need to re-establish their "shut-down" mindset. Someone still needs to buy me a ticket to tonight's game.